If 3—4x a week has good results, will more frequent sessions yield a better result? Is iGrow® safe to use at home? The iGrow® has been specially designed with safety features for at—home, office and travel use, including a safety mechanism controlling both laser and LED devices. In addition, the iGrow® is designed so that it can only be turned on when it is firmly placed on your head. The iGrow® is a safe and effective laser hair treatment for use at home or while travelling. Yes, the iGrow® requires no manual movement. Simply, place the iGrow® on your head, select one of 5 pre— programmed sessions and then sit back and relax. When will I know if iGrow® is working for me? Every person is different. However, within 12 to 16 weeks of using iGrow® as directed, most users report that they can see a positive change. The appearance of thicker, fuller, and healthier—looking hair is typical within 24 weeks, or 6 months of LLLT. Is iGrow® regulated for safety? What do I do if my iGrow® has stopped functioning properly? Apira Science offers a full 12-month warranty for the iGrow®. The warranty protects against factory defects and workmanship errors. If your unit has stopped functioning within this time period, please contact our customer service department, so that we can personally assist you with your warranty return. What if my unit has stopped working and I am out of the warranty period? In the event that your unit stops working after the 12-month warranty period expires, contact our office immediately, to arrange for a return. Upon inspection of the unit we can quote you the price to repair and/or replace it. We can ship internationally to most parts of the world. In some areas, we will refer to you to our local distributor. Is there a guarantee that comes with the iGrow®? Because we are certain you will be satisfied with your iGrow®, we offer a generous money-back guarantee. 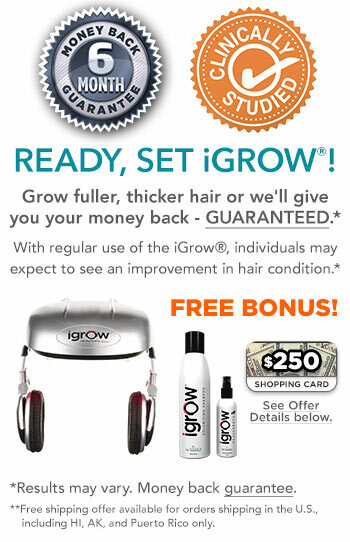 In order to qualify for this money-back guarantee, you must use the iGrow® 3-4 times per week, as instructed in the owner's manual, for six consecutive months. If in the unlikely event you want to return your iGrow® after this 6-month period, you will have 30 days to request a RMA number to return your iGrow®. Once your product is received, your purchase price (less Shipping and Handling), minus an 18% restocking fee, will be refunded to you. You will also be required to pay for the return shipping cost. Please note that only orders placed directly through Apira Science, Inc. are eligible for the money-back guarantee. You will need to call (561) 465‐7000 to obtain a Return Material Authorization (RMA). I bought my iGrow® from a distributor. How does this affect the product warranty, and is the distributor's guarantee or return policy the same as from Apira Science Inc.? Each distributor is responsible for setting their own guarantee and return policies. If you purchased the iGrow® or products from a distributor you will need to contact them about their specific policies regarding guarantee and returns. Apira Science Inc. is not responsible for refunds or credits, if purchased from a distributor or third party. Apira Science Inc. is responsible for the product warranty regardless of where the iGrow® is purchased.